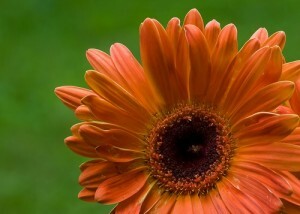 The gerber daisy is one of my favorite whimsical flowers, it’s ideal for a more casual look. They come in so many different colors- white, cream, light yellow to bright yellow, peach to bright orange, bright red to dark burgundy and light pink to bright pink. 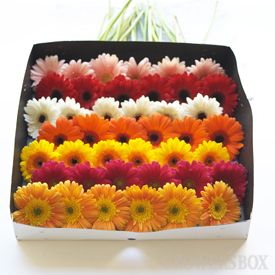 When ordering them you can also specify whether you would like the center to be black or light. This is a common way they are shipped. Usually by the time I get a hold of them they are somewhat dehydrated and their necks are very weak. At this point I pull them from the box, dip them in an acid solution and then place them in water with floral conditioner (food) in it. I have to be very careful when they are weak not to let them hang over the side of a bucket because once they start drinking water and firming up, their necks are permanently stuck in whatever position they have been placed in. One way to deal with this is to pull chicken wire over the top of the bucket, then drop your daisies into the water and let the chicken wire hold up their heads. In an arrangement they either need to be wired or gerber sleeves need to be placed on them because their heads are so heavy they can droop quickly. 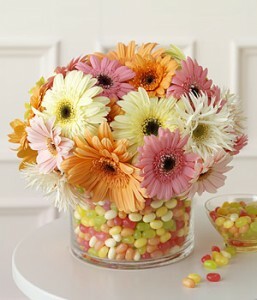 Cute idea for a glass container. This was a centerpiece I did for a wedding last fall at Circle Bar Ranch with the ever-so talented wedding planner Cicely of Life Design Events. 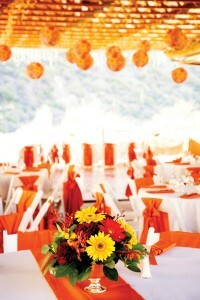 It’s featured in the current issue of Arizona Bride, check out the full article.